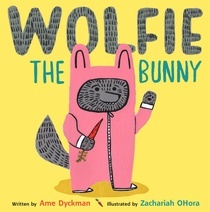 I suspect there are all kinds of meaningful child development type things that someone could say about Wolfie the Bunny by Ame Dyckman with illustrations by Zachariah OHora. Stuff about understanding family, stereotypes, yada yada. I liked it because it's funny. This book does require a little life knowledge on the reader's part. For instance, wolves usually eat bunnies. Parents usually love babies. Older kids usually watch out for younger kids. So it's probably a book for parents and older preschooler/kindergarteners to enjoy together. I loved the page layout, with text all over the place and in different sizes. Sometimes that kind of thing becomes pretentiously arty. Not here. And this book has some terrific illustrator and author notes at the back, in which OHora and Dyckman write about their inspirations for the illustrations and text. There's also a quite fascinating paragraph on all the other people who worked on this book, editing, design, and production.